This post is brought to you EVITE® & 100% DOLE® Canned Pineapple Juice. Every year, the kids and I set up shop in my mother-in-law’s kitchen and bake, bake, bake for the holidays. The kids take turns licking beaters, scooping batter and decorating cookies before eventually heading off to play. While we have a few recipes we make every single year, my mother-in-law and I love to find new recipes and ideas to bring to the kitchen. This year, I’m bringing all of the ingredients for Pineapple Cinnamon Cupcakes. 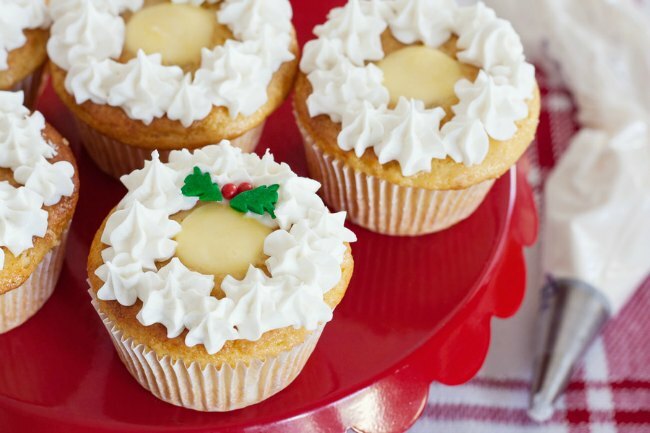 With cream cheese frosting and a sweet pineapple center, these pineapple cinnamon cupcakes are delicious. And I especially love that while they’re homemade, they still include a box of cake mix. Don’t you love it when you find new ways to use a cake mix? My other favorite part? The surprising addition of 100% DOLE® Canned Pineapple Juice. My husband loves to be surprised when he bites into a cupcake, and I have no doubt that these are going to become his favorites. 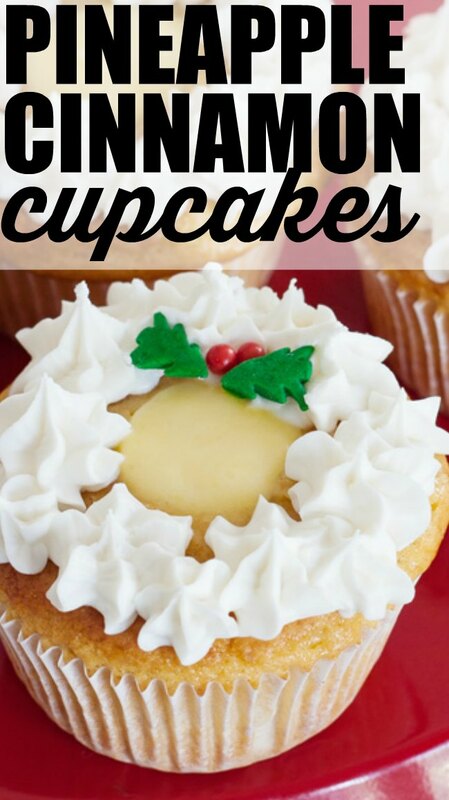 In fact, something tells me I’ll be making these long after the holidays are over. 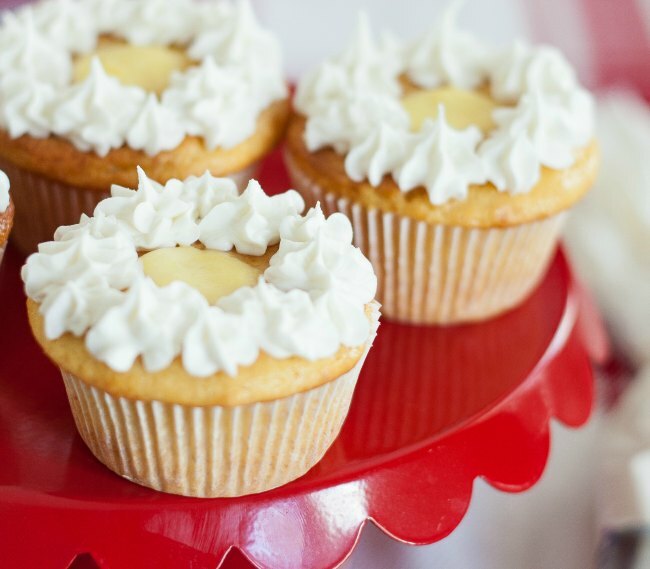 With cream cheese frosting and a sweet pineapple center, these pineapple cinnamon cupcakes will be a hit at your next party. Stir together sugar and cornstarch in medium saucepan, then gradually stir in 1 1/4 cups pineapple juice. Cook over medium heat, stirring occasionally for 5 to 6 minutes or until mixture boils and thickens. Remove from heat and stir in butter, then pour into bowl. Place plastic wrap directly on filling and chill 2 to 8 hours. Beat eggs with cinnamon at medium speed using an electric mixer for 2 minutes. Add sour cream and pineapple juice, beating well. Add cake mix and beat at low speed until just blended, about 2 minutes. Spoon batter into prepared cups, filling 2/3 full. Bake for 25 to 27 minutes or until wooden pick inserted in center comes out clean. Remove from pans and place on wire rack to cool completely. Scoop out centers of cupcakes, using a 1-inch melon baller and leave a 1/2-inch border around edges. Discard or reserve centers for another use. Spoon a heaping tablespoonful of pineapple filling into center of each cupcake. Pipe cupcakes with buttercream frosting. Click here for more information about this recipe. This post is sponsored by EVITE and Dole.